When you buy a pair of RM Williams boots such as the Craftsman or Stockman, you know you’ll be receiving a pair of beautiful (and not forgetting extremely comfortable!) shoes. They are still made using Reginald Murray’s original design – one piece of material, hand-moulded and fixed at the back of the shoe – which gives the boots their sleek, sophisticated lines, and helps to protect your feet from rubbing during day to day wear. Thanks to the high quality materials that go into their manufacture they are extremely long lasting, and when the boots do (eventually!) begin to show signs of wear you can replace the soles, heels, elastic and linings of the boots again and again. However, the biggest joy about owning boots from R.M. Williams is their sheer versatility. They are the perfect accompaniment for any outfit and any season, and will take you from work, to play, and back again for years to come. But we’ve put together a few outfits if you need further convincing! The Comfort Craftsman is the classic boot from RM Williams. Available in a range of colours, including black, whiskey, dark tan and this beautiful chestnut, it’s the item that you never knew your wardrobe was missing! Alternatively, by swapping the polo for a shirt and cosy Schoffel Manton coat, you are now ready for a crisp autumnal walk through the countryside. As the boots only have one seam, there’s less chance of wet feet if you encounter a puddle or three! RM Williams aren’t just for the guys! These classic Chelsea boots are made from premium suede that leaves them super soft and stroke-able. They are also made using the same traditional techniques as the men’s collection, so you can be sure that they will be a key part of your wardrobe for years to come. Mix them with the gorgeous contemporary Barbour Sycamore coat (which is a slightly shorter, cropped version of the classic Trench coat), a shirt and moleskin jeans, and this is the perfect look to have an adventure in! 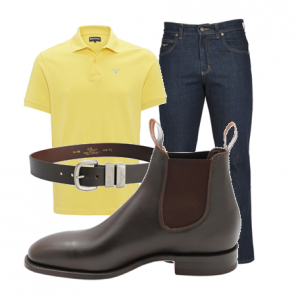 Alternatively, dress the the Kimberley boots down with the stunning sunkist coral Carolina trousers by Musto and Barbour polo shirt, and you now have a comfortable, casual, yet stylish look. All items mentioned in this blog post are available from philipmorrisdirect.co.uk. So what are you waiting for! barbour, clothing, Dubarry, Emma Bridgewater, how to wear, Musto, Philip Morris & Son, R.M Williams, Sch?ffel, wildcotton. Bookmark.